Welcome friends! This week was full of ups and downs and lots of stuff going on. 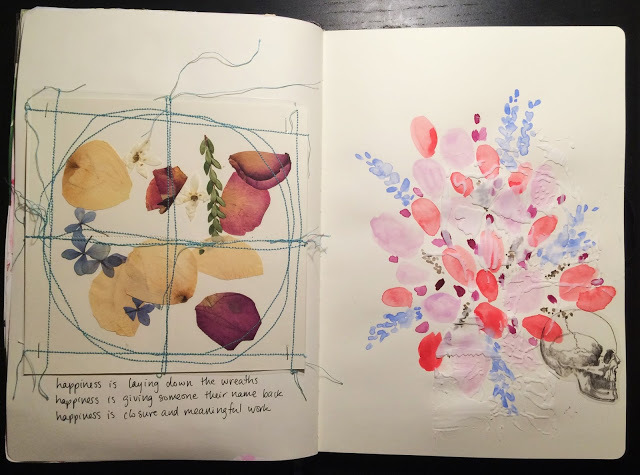 So I only have one art journal spread to share…and a bunch of gelli prints after that. The spread came together at the last minute and is the result of a conversation with Jennifer Bilton. We were talking about funerary customs and flowers associated with mourning. At the same time, for my work and a conference I gave yesterday, I was reading up on two First World War soldiers who were identified and reburied with a name and in the presence of their descendants almost 95 years later. (Sorry no daylight photos this week at all). I love my job. I love the whole idea of laying these men (sometimes boys) to rest all these years later. I love the idea of them being buried with their brothers in arms and by their unit in a military ceremony. I love this work and I am humbled to participate in it. This is happiness for me. 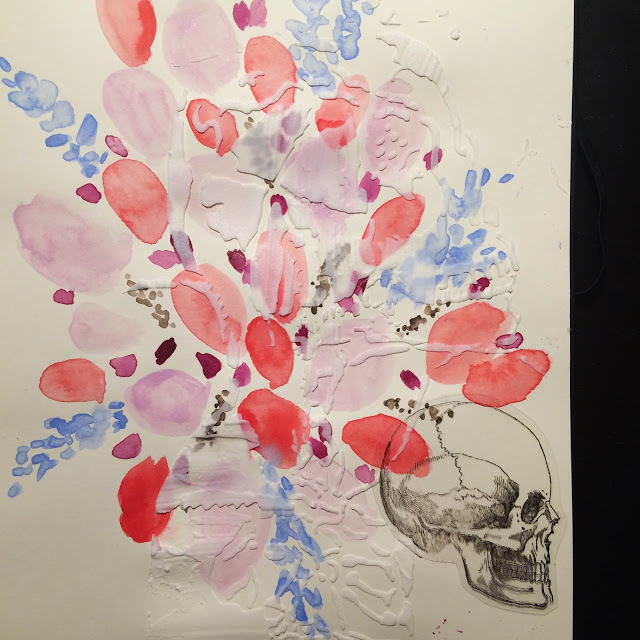 The pressed flowers are from my maid of honor’s bouquet at my sister’s wedding last year. I had Essie‘s tutorial in mind when I made this page. 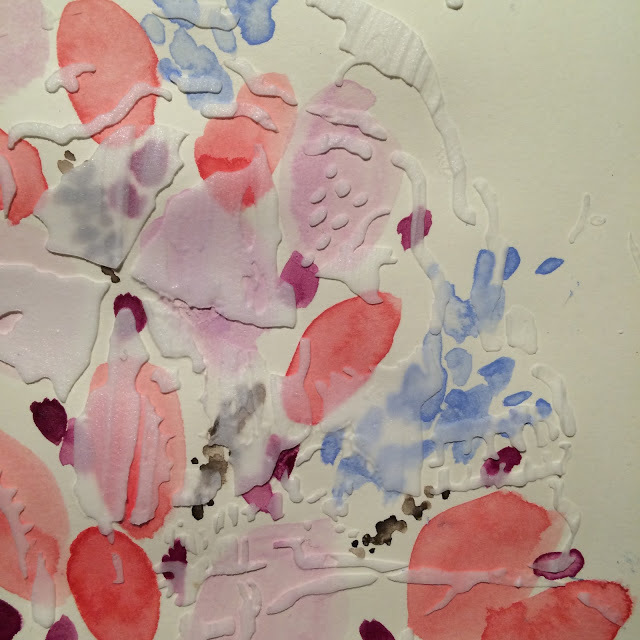 I used a similar color scheme for the watercolor flowers as the pressed petals. 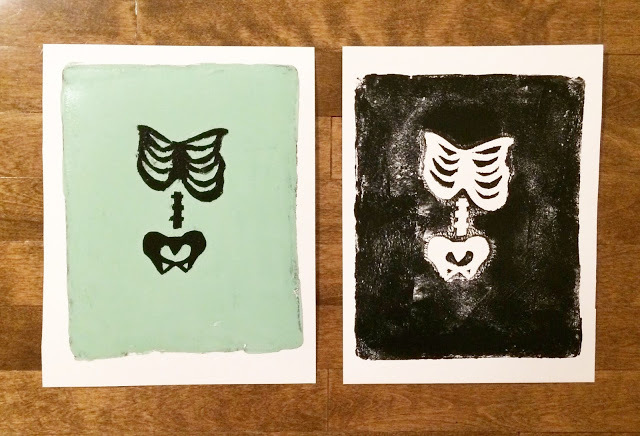 I put some modelling paste through a stencil featuring one of Orly’s skeletons. You can just guess at its presence. Aaaand to make it more ‘me’, I stapled the transparency. I love stapling stuff. And then I fell down the rabbit hole. Gladly. There were bones. 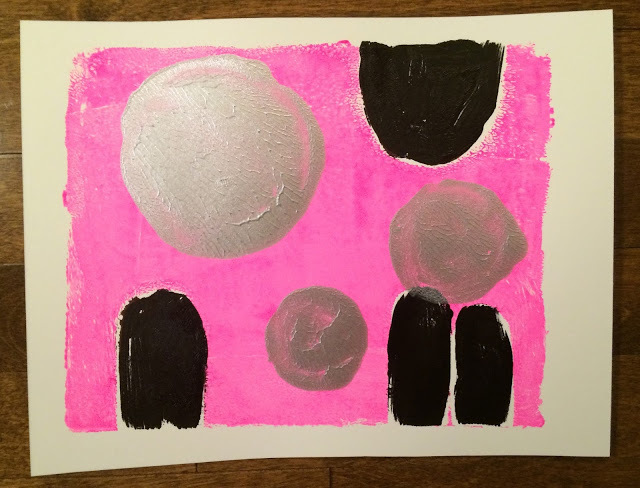 I’m really loving the possibilities…and that texture! 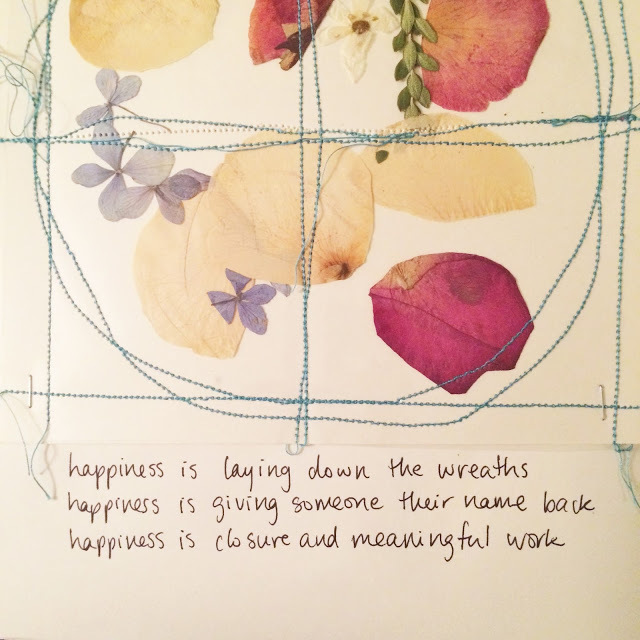 My only problem is that I love these too much to cut them down and stick them in my journal…yet. I may frame those bones, I love how they turned out. I’m also thinking of binding some of these following Tanyalee’s tutorial…. Have I mentioned how cool this community is? Dans la dernière, je vois des vampires ! Mais je me suis fais une nuit X-Files la nuit dernière ! moi qui adore les vampires…et X-Files! I love this so much! I'm also super inspired by oue conversation and I love how many things fall and are falling into place through this community. ❤ I'm also in awe of the way youve sewn the wreath and your words about your work. Stellar. 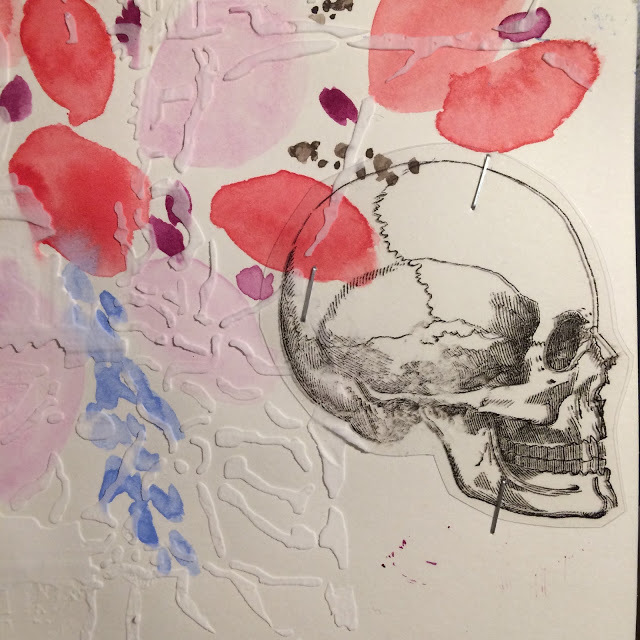 Love the flowers & reason for your layout…amazing & wonderful for the family of the soldiers. 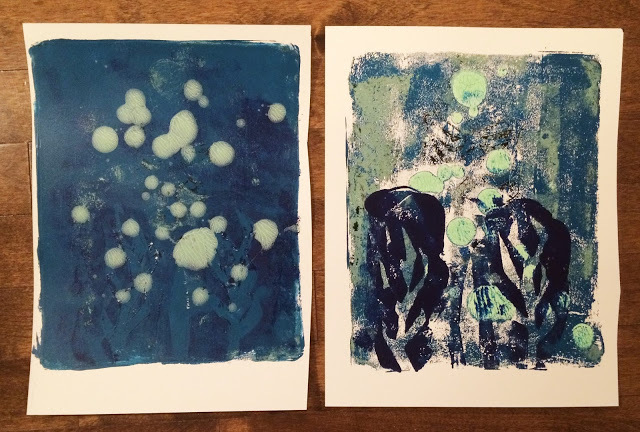 I'm intrigued with your last gelli print as to how you got the white texture? …so very creative! thank you Gilly! 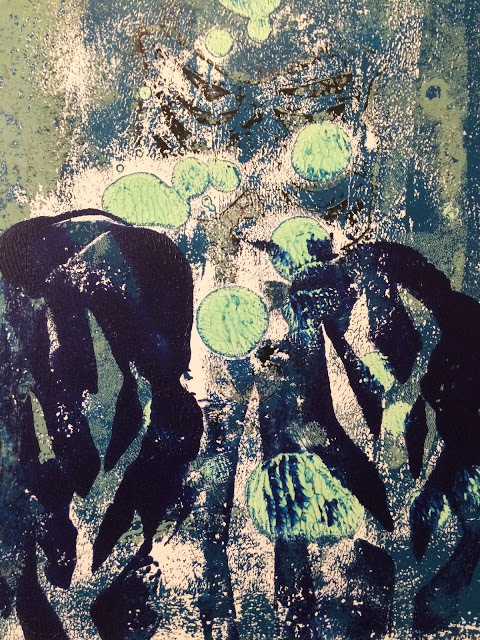 That last print was picking up the 'leftover'layers from the gelli plate, so there were some 'naked' spots so to speak.